T'ej: The Ethiopian Honey Wine – Learn all about the history and culture of t'ej – and how to make it. 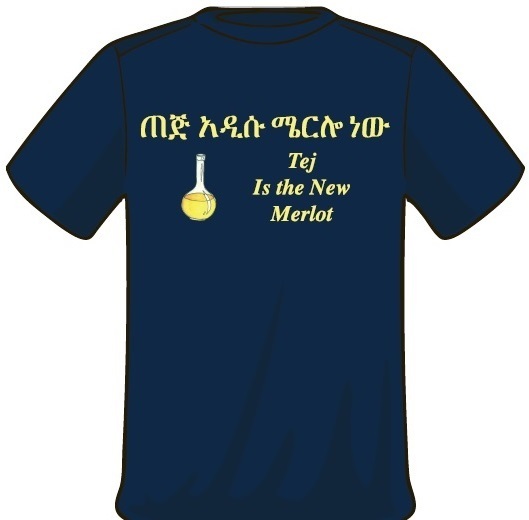 T’ej is the new merlot. Well, maybe not yet. But if everything old is new again, then it could just happen. 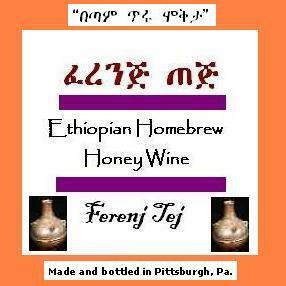 Welcome to the world’s largest and most comprehensive website about t’ej, the 2,000-year-old Ethiopian honey wine. In the following pages, you’ll learn all about this delicious potable, including how to make it at home in your kitchen (which I began to do myself in 2007). You can also visit my site about Ethiopian food, where you’ll find dozens of articles as well as recipes, along with information about my book, Mesob Across America: Ethiopian Food in the U.S.A. Preparing Ethiopian food is no harder than most cuisines and far easier than some, so if you’re a gourmand, then give it a try. And my restaurant guide lists every Ethiopian and Eritrean restaurant in the country state by state. Note, too, that at the top of this site and on the right, there’s a menu of pages: About the Author, About the Book (Mesob Across America: Ethiopian Food in the U.S.A.), T’ej Names (see how to say “honey wine” in 93 Ethiopian languages), and Making T’ej: A Video (which you can also see in Chapter 5: Making T’ej at Home). Here are the chapters you can explore as you learn about t’ej. Choosing Home from the page menu will always bring you back to this chapter index. Just click the links below to visit the site’s pages. 1. A Brief History of Ethiopia. Before learning about t’ej, take a quick walk through the key moments – both legendary and true – in the history of Ethiopia. 2. The Meaning of T’ej. In a country with nearly 90 languages, where did the name “t’ej” come from, how do the many cultures of Ethiopia say “honey wine” in their own languages – and why is there an apostrophe in the name? This page includes a chart that documents the words for “honey wine” and “honey” in Ethiopia’s more than 90 languages. 3. T’ej in History. When European visitors began to explore Ethiopia, they discovered t’ej. Some liked it, and some didn’t, so these early narratives are often informative but just as often critical or even comical. 4. T’ej in Ethiopia Today. Sometimes called the “national drink of Ethiopia,” t’ej is cherished by everyone in the nation – except, perhaps, for Moslem Ethiopians who eschew alcohol. 5. Making T’ej at Home. Here’s the moment you’ve been waiting for: You can learn how to make t’ej in a one-gallon jar in your kitchen. When you do, why not serve it with some homemade Ethiopian food (or take it to a BYOB Ethiopian restaurant)? 6. Winery T’ej. OK, so you don’t want to make your own t’ej. Numerous wineries in the United States (and even Europe) make it, although it can be hard to find, depending upon where you live and whether your state permits you to have wine shipped from out of state. Here’s a roundup of some commercial t’ej brands. 7. T’ej Cocktails. You can drink your t’ej straight up, or you can experiment by trying some cocktail recipes that Ethiopians (and others) have created using t’ej. 8. The Science of T’ej. Scholars have studied the history, culture and microbiology of t’ej for decades, and many of their research papers and even dissertations are available online. I hope you find this site to be both informative and enjoyable. Feel free to contact me with questions and comments.